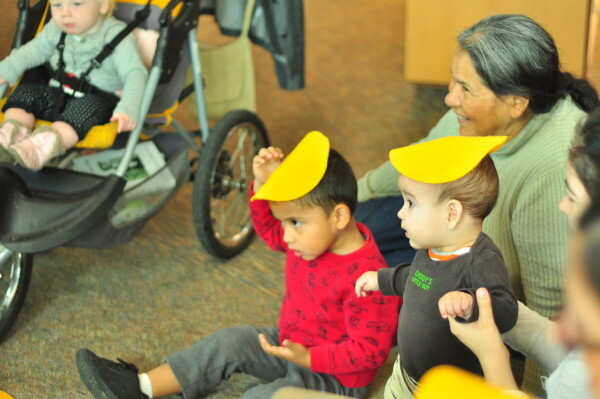 Notice as of January 2018 – Family Storytime Wednesday Mornings at 10:30 am, Bilingual Storytime Thursday evenings at 6 pm. In the northeast corner of the Winters Community Library, Linda Glick awaits a small stampede. Everything is quiet and empty until the strollers, parents and grandparents roll in to fill the chairs and carpet squares. It’s 10 a.m. on Tuesday morning. “Happy You are Here Today” begins to play on the music box. More little bodies race in like chickens running to the food yard. Little Josue beats the big round drum, for “The Drum Song,” then Elianna, then Xavier. More parents come in and fill spaces on the floor. A new mom rocks her infant in an Ergo while her little daughter sits up front in the action. Finger songs and games follow the big welcoming. Kids join in “The Bubble Song” and assist in blowing and popping bubbles. It’s exuberant for the 3-year-olds and exhilarating for the younger set. Every age has a way to participate, even the moms and grandparents. Teacher Linda stands next to a blue felt easel and brings out the book, “Pete the Cat: I love my White Shoes,” by Eric Litwin. As the story is read, Linda signs the main nouns and colors. The kids say the colors in Spanish and English and point to the new adventures for Pete the Cat. Pete may have his adventure, but the real adventure is here in the library where the kids squeal, shout, clap and whisper along with the story. It is also music time, community time, and learning time. While the kiddos are “shaking their sillies out,” they are also following directions, celebrating community and making new friends. The library is free enrichment for the community. It’s a free opportunity for guided play, learning and singing under the command of Glick, co-president of Winters Friends of the Library (WFoL). Glick is newly “retired” after 35 years of teaching experience through Yolo County Office of Education. She specialized in teaching pre-school and special education with the last five years of work focused on infants and babies. Although retired, she does story time and also volunteers for Yolo Family Services Screening Project, which screens for the American Association of Pediatrics. In other words, she’s no slouch to the needs of kids. And no slouch in age-appropriate academia. 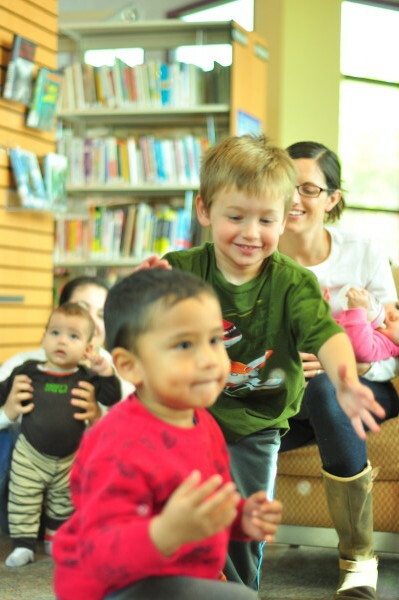 While Story Time is free to the community, this service and many others are supported by Winters Friends of the Library, (WFOL) which contributes to the reading props and activities that are part of Story Time. The parents disperse from Story Time and over to the play area. Longtime Winters Resident Elia Arce was there with her 2-year-old grand daughter Elianna. “I always come to Story Time because Elianna loves it so much,” says Arce, who was a credentialed school teacher herself, and also worked as an aide at Waggoner while raising three kids, who all have master’s degrees now. Ameryn Briggs and her son Sage started coming to Story Time when Sage was one and a half years old. Note:This piece written by Jesse Loren is excerpted/reprinted with permission. It was published with the title “Story Time made possible by Friends” in the April 23, 2015 edition of the Winters Express Thanks to Jesse Loren and the Winters Express for sharing this story. WFOL raises funds on the Big Day of Giving and throughout the year which gives the community an opportunity to give financial support for so many of the library services WFOL enhances and other literacy and library related program WFoL provides. If you would like to contribute you may donate here.